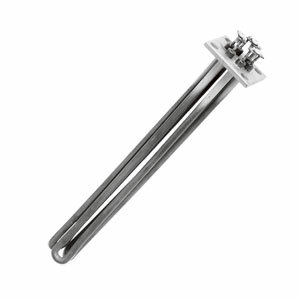 Type TTSF heaters are used in industrial water boilers and storage tanks. They feature high watt density for rapid heat transfer. The steam boiler heaters feature the highest quality, high nickel Incoloy sheath that provides the highest practical protection available against hard water containing minerals, scale and salts while resisting stress, corrosion, cracking, and sulphur attack. The water heater has a copper sheath and copper face plate. These heaters are not supplied with enclosures since they are normally mounted in boilers or tanks which have a surrounding enclosure for terminal protection. Wattage: 5 to 18 kW Power: 208 and 240 or 480VAC, 3 Phase Watt Density: 79-184 W/in2 Sheath: 0.315" dia. Incoloy (steam boiler heater) or copper (water heater).